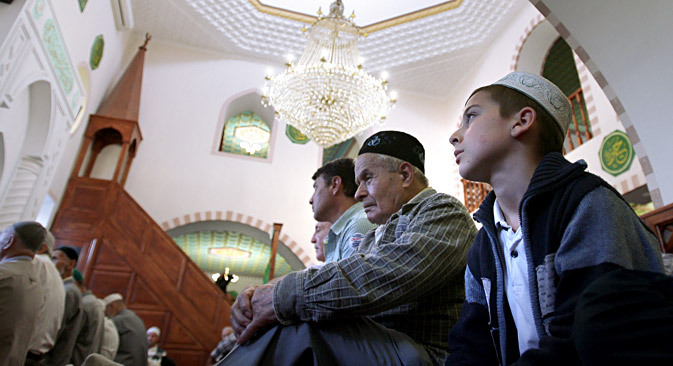 Russia's controversial takeover of Crimea in March 2014 has led to a split among the native population of the peninsula – the Tatars. While senior Crimean Tatar public figures generally oppose Russian rule and call for the territory to be returned to Ukraine, another part of the Crimean Tatar elite is in favor of forging a future as part of the Russian Federation. While representatives of the Crimean Tatar community called for an end to Russian rule in Crimea at a world congress in Ankara on August 2-3 and condemned Moscow’s takeover of the territory, there appears to be a split developing among those who have chosen to remain on the peninsula, with some in favor of forging closer ties with Russia following its takeover of Crimea in March 2014. Attended by representatives of the Crimean Tatar diaspora from 12 countries, the congress was organized by one of the ethnic group’s longstanding leaders, Soviet-era dissident Mustafa Dzhemilev, who now holds the position of authorized representative of the President of Ukraine on Affairs of the Crimean Tatar people, and Refat Chubarov, the chairman of the Mejlis (the representative body of the Crimean Tatars). The congress condemned the “annexation of Crimea” by Russia in March 2014, accused the Russian authorities of disregard for fundamental freedoms of the people, and appealed to the United Nations to recognize Russia's actions against the Crimean Tatar people as genocide. However, Kyrym, a pro-Russian public Crimean Tatar organization formed in 2014 that says its role is to assist in “the revival of the Crimean Tatar people,” criticized the congress and accused the organizers of an attempt to mislead the representatives of the Crimean Tatar diaspora. Meanwhile, Alexander Formanchuk of the Crimean division of the Moscow-based Institute for Socioeconomic and Political Research expressed doubt in an interview with RBTH that Crimean Tatars who are actually from Crimea were adequately represented at the Congress. “As far as I know, only 17 people at the congress were actually from Crimea, and most of these 17 were not from Crimea itself, but from the bordering territories of Ukraine. The rest of the delegates were representatives of the diaspora,” he said. Yet according to a report by Radio Liberty, Russian authorities made it difficult for Crimea-based representatives to attend the event in Ankara, with two local Crimean Tatar leaders being prevented from leaving the peninsula. Descendants of the Golden Horde that ruled the region from the 13th century onward, the Crimean Tatars were conquered by the Ottoman Turks in the 15th century, resulting in the creation of the Crimean Khanate. The Khanate lasted three centuries before being annexed by the Russian Empire during the Russo-Turkish wars in 1783. Relations between the Crimean Tatars and Russia have been poisoned ever since the mass deportation of the entire community on the orders of Joseph Stalin, when in just two days in 1944 the Crimean Tatars (numbering around 230,000) were forcibly evicted to remote areas ofthe Soviet Union, mainly Uzbekistan,accusedof having collaborated with the Germans during the Nazi occupation of 1941-1944. Some historians estimate that up to 100,000 Crimean Tatars died as a result of the deportation – which is widely seen as an example of ethnic cleansing, with some historians classifying it as genocide. Families were allowed to resettle in their ancestral land from 1989 onward, but the Crimean Tatar population currently stands at just 13 percent of the total population of the peninsula. “The deportation was the most terrible crime against the Crimean Tatar people, it caused the death of up to 40 percent of the population,” Crimean Tatar journalist and public figure Aider Muzhdabayev told RBTH. Their hostility towards the Russian authorities and the memories of deportation meant that many Crimean Tatars took the s of Crimea by Russia very negatively. “The Crimean Tatars were against it, but their opinion was ignored. Even before the referendum [held on March 16, 2014 on the peninsula’s accession to the Russian Federation – RBTH] Crimean Tatars held mass protests, but the Russian media did not report it,” said Muzhdabayev. The representatives of the Mejlis of the Crimean Tatars called on members of the community to ignore the March 16 referendum and Dzhemilev warned that Russia would face ethnic violence if the peninsula were to be ruled from Moscow. Despite the fact that many Crimean Tatars are still dissatisfied with Russian rule, Dzhemilev's prediction has not come true, though he told the congress on Aug. 2 that around 10,000 Crimean Tatars have already fled the peninsula, mostly to Ukraine. “The vast majority of Crimean Tatars have received Russian passports, [and] receive pensions and social benefits. In 1.5 years under Russian rule there have been no ethnic clashes neither large protests against the government,” he said. However, an official report published in March by international human rights organization Amnesty International documented numerous human rights violations and the disappearance of seven people on the peninsula in the last 12 months, including three Crimean Tatars – one of whom was found dead in spring 2014 with marks on his body consistent with torture. The Crimean Tatar elite, who generally support Dzhemilev and Chubarov, stand for Crimea as part of Ukraine. But there are those who support the new government. “The Tatars are motivated to participate in building the new Crimea, and no one can advise the authorities how to solve their problems better than them,” Russian business daily Kommersant quotes Zaur Smirnov – one of the representatives of the Mejlis who is loyal to the Russian authorities (Smirnov is now chairman of the State Committee of the Republic of Crimea) – as saying. However, while Alexander Formanchuk describes disagreement as “normal,” Aider Muzhdabayev criticizes Crimean Tatars who have taken a pro-Moscow stance, accusing them of a lack of integrity. “These people have compromised with the Russian authorities in order to keep their business, their status in society. They cannot be called the real Crimean Tatar elite, people do not respect them,” he said.